Keyboards/backup singer - Entrusted365 from Carlisle, PA.
Local Praise and Worship bands. Jillian Whittaker is a pianist who grew up in New Jersey, but has lived in Pennsylvania for the past nine years. She has played piano for many events in different facilities from small churches to large auditoriums. She has accompanied college and church bands, choirs, orchestras, as well as performing as a solo musician at weddings, conferences, and other events all over the tri-state area. She completed her Bachelor’s in Music Ministry at Lancaster Bible College in 2007, where she toured with the choir up and down the east coast as Head Piano Accompanist. She even had the unique experience of accompanying church services in Jamaica during a missions trip in 2005, while also serving as the missions team drama director. Not long after graduating college Jillian was accepted into the week long "Summer Shot" program at the Musician's Institute in LA, where she took classes from Instructors who toured and recorded with Major Artists. She always loved to learn new instruments, and was also trained in voice, flute, harp, hand bells, Irish penny whistle, timpani and other percussion. Jillian likes to play with other musicians, and has experience directing small bands and vocal teams. Her favorite styles are Broadway/Movie Soundtrack, Pop, and rock but will gladly play anything set in front of her. 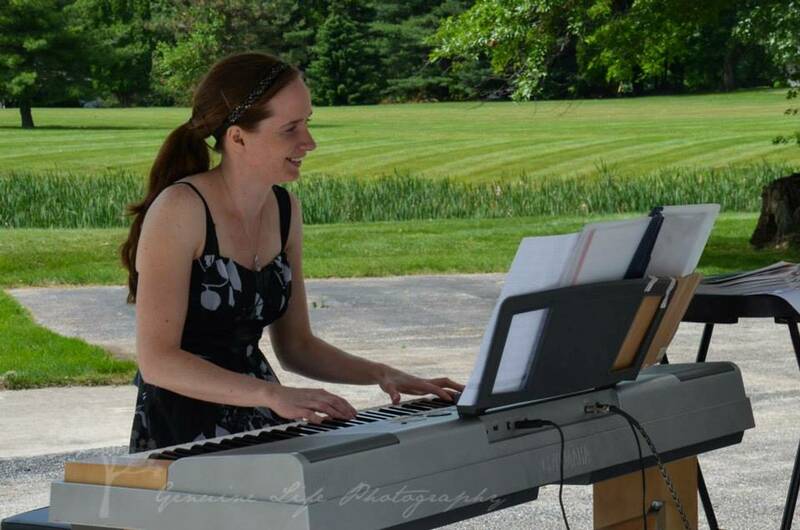 She is currently a piano accompanist and praise team member for a few local churches, and teaches private piano lessons to beginner students. For fun Jillian loves to sing, dance, act, and volunteer as a stage technician for concerts and live theater. She also has a heart for healthcare, and currently works "by day" as a Licensed Massage Therapist. 2 yrs Keyboard/backup vocals for the band "Dance Fairies Dance"
Music Director for 2 children's musicals. Intern Worship Director for New Durham Chapel in NJ. Certificate in Bible from Word of Life Bible Ins. Summer Shot Certificate from Musicians Ins. Classes in Jazz, Funk, Rock, songwriting and theory. Performed with 4 rock bands.